Since 2005, Calgary First Aid has been offering training courses for cardiopulmonary resuscitation (CPR) and first aid for the cheapest possible rates. Learn basic or advanced first aid and CPR skills with the top provider in Calgary and receive certification to help build your resume and enhance your career. Certification provided through this provider meet workplace and academic requirements and follow the latest ILCOR (governing body on CPR) standards. Participants can also register for food safety certification programs, H2S training on-line workplace safety courses. Visit the Calgary First Aid website here to view a complete list of available CPR and first aid training classes. The facilities are easily accessible – within walking distance to and from public transportation, free parking, restaurants, and shops. Rates are the most competitive at Calgary First Aid. With no hidden fee’s and the lowest prices in Calgary courses fill up quick. Register today to reserve your spot. Full refunds are given to trainees who provide 72-hour notices before dropping out. 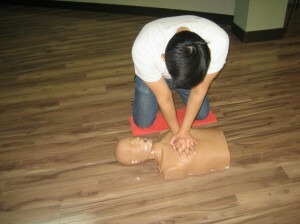 Programs for CPR are available in three levels all of which include defibrillation (AED) training. A no pressure policy is available for participants that do not successfully complete the program. Individuals can re-take the course at no extra cost if they attend and do not complete the course the first time. Private classes are available for groups, businesses and individuals looking for training to be held at their facility or at the Calgary First Aid training centre. St Mark James Training awards the certificates after the completion of a training program. The certificate is valid for three years and renewable. Standard first aid, standard childcare first aid and stand-alone CPR courses are available for re-certification at least 3 times a week at each training facility. Did You Know? Prinzmetal’s angina/Variant angina Prinzmetal’s angina is a kind of angina that has a mixture of stable and unstable angina symptoms. Like stable anginas, it is relieved with rest and medication and like unstable anginas, it is severe and usually happens at rest or without any exertion or activity being done. Variant angina is another name for Prinzmetal’s, and is caused by unpredictable spasms of the coronary arteries that supply the heart with blood. This kind of angina is uncommon, only occuring in 2% of the total angina cases.